This is a beautiful example of an 1831 Society for the Diffusion of Useful Knowledge or S.D.U.K. map of Egypt. It depicts Egypt, centered on the Nile River from its delta on the Mediterranean south as far as Nubia and from the Gulf of Buschaifa east as far as the Dead Sea. The map names numerous tribes throughout, and offers other interesting cartographic annotations, such as 'In 1801 the British army cut through the causeway that separates Lakes Aboukir and Mareotis. Though the division in repaired, the sea still partly comes through.' The map also notes numerous cities and villages along the river as well as various ancient Egyptian ruins including the Pyramids of Giza. 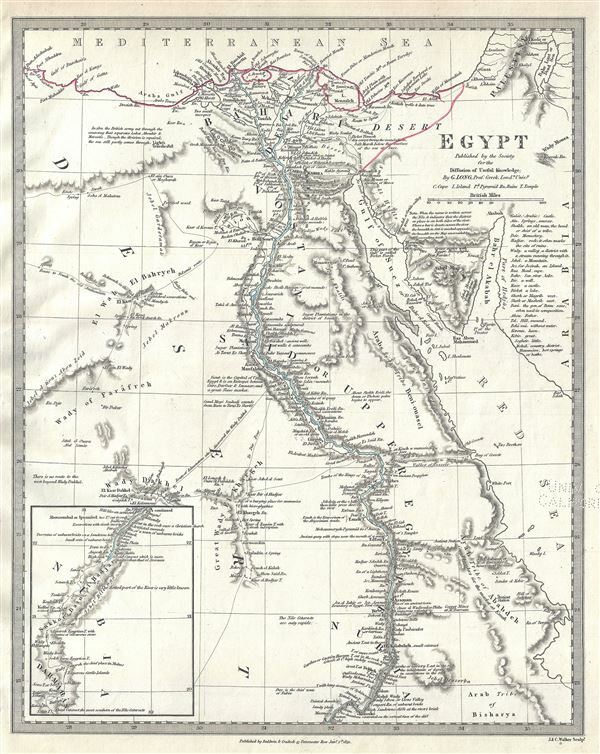 Near Suez, the map identifies the Ancient Canal which would soon give way to a more modern variant. Numerous caravan routes are mapped throughout. An inset in the lower left quadrant features part of Sudan. This map was prepared in the declining days of the Ottoman Empire. After the conquest of Palestine by Muhammad Ali's Egypt in 1832, British intervention returned control of Palestine to the Ottoman rulers in 1840. In Egypt, following the expulsion of the Napoleonic forces by the Ottoman Mamluk Turks, Muhammad Ali, the Ottoman viceroy of Egypt, established the Mamluk dynasty that would rule Egypt until the Egyptian Revolution of 1952. Between 1820 and 1833, Ali annexed northern Sudan, Syria and parts of Arabia into the Mamluk Empire. Rumsey 0890.119. Phillips (Atlases) 794.